The President, Professor Rob Archbold was in the chair; about 80 members and guests were present. Sir John Ball is Sedleian Professor of Natural Philosophy at the University of Oxford. He has made many important contributions to non-linear mathematics and its applications, particularly to problems in elasticity and to the microstructure arising from phase transitions in solid materials. He was elected to the Royal Society of Edinburgh in 1980, to the Royal Society of London in 1989, to Foreign Membership of the French Academy of Sciences in 2000 and to Foreign Membership of the Norwegian Academy of Science and Letters in 2007. Other awards include the 1995 Naylor Prize of the London Mathematical Society, the 1999 Theodore Von Karman Prize of the Society of Industrial and Applied Mathematics, and the 2003 David Crighton Medal of the Institute of Mathematics and its Applications and the London Mathematical Society. He is a former President of the Edinburgh Mathematical Society, the London Mathematical Society and, most recently, the International Mathematical Union, where he has strongly supported the advancement of mathematics in developing countries. In addition, he holds Honorary Doctorates from the Ecole Polytechnique Federale de Lausanne, the University of Montpellier II, the University of Sussex, the University of Edinburgh and Heriot-Watt University (where he was for many years a professor). In 2006, he received a knighthood for services to Science. It is no exaggeration to say that Professor Murray is the "Father of Modern Mathematical Biology". His book "Mathematical Biology" has been cited well over 3000 times and has had a huge impact on a generation of students and researchers in this field. His research includes applications of mathematics to almost all areas of the life sciences, but he is best known for his work on embryonic development, which has made major advance both in biological understanding and in the mathematics of pattern formation. He was elected to the Royal Society of Edinburgh in 1979, to the Royal Society of London in 1985, to a Fellowship of the Institute of Biology in 1988 and to the Foreign Membership of the French Academy of Sciences in 2000. He was awarded the Naylor Prize of the London Mathematical Society in 1989 and he is a former President of the European Society for Mathematical and Theoretical Biology. In addition, he holds Honorary Doctorates from the Universities of Milan, Strathclyde, Waterloo and St Andrews (where he was both an undergraduate and Ph.D. student). A chair has been recently endowed in his name at the University of Washington - the James D Murray Chair of Applied Mathematics. Professor Edmund Robertson, on behalf of the St Andrews History Team (Ms Marit Hartveit, Dr John O'Connor and himself), explained that they had produced a History of the Society. This was available in the form of a short booklet, and also on the internet. Several lap-top computers had been installed in the Conference Room in the David Hume Tower so that guests could inspect these materials. "Aspects of Galois theory in arithmetic geometry." At the end of the talk, a vote of thanks was given by Professor Jim Howie of Heriot-Watt University. At this point there was a break for tea. Before introducing the second speaker, the President reported to the Meeting on some recent correspondence with Professor Walter Ledermann, who is currently the longest-serving member of the Society. "A relaxed approach to optimization with geometric constraints." At the end of the talk, a vote of thanks was given by Professor Tony Carbery of the University of Edinburgh. The meeting was formally adjourned at 6 p.m. Here is the poster advertising the 125th annivesary. 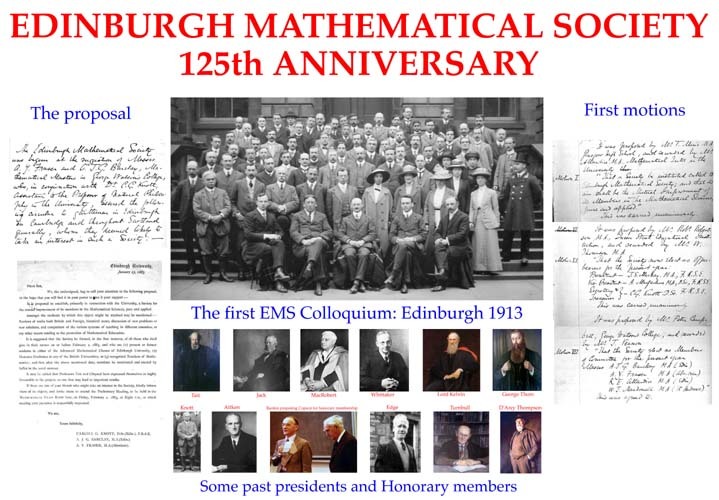 A version of the booklet produced for the 125th Anniversary is at THIS LINK.